Is it wrong to dress tofu in chimichurri? Maybe. But, pill it makes a damn good sandwich. Chimichurri is a delicious Argentinian sauce usually drizzled over freshly grilled meat, infection and most often over skirt steak. It’s made by blending olive oil, visit this site parsley (I like Italian Parsley myself), lemon juice, garlic, red pepper flakes and salt together like you would a pesto. The bright green sauce is rich, herbal, tangy and a little spicy. Just the thing for grilled meats, and apparently just the thing for spicing up an otherwise bland piece of tofu. As you all know, I’m by no means a vegetarian. I love my bacon, beef, pork and lamb. Seafood, too. Yum! So, it may seem surprising that I’ve also grown to love tofu. You just can’t think of it as a meat substitute. It’s no replacement for steaks and burgers, but it has its own unique flavor and texture. I love how it soaks up its marinade and develops nice, crisp grill lines. Paired with some greens and piled onto toasted pumpernickel, it made a hefty and flavorful sandwich. My beef-jerky-loving Midwestern man ate it up and asked for seconds. Chimichurri and a grill are always a winner, and can probably turn the most rabid tofu haters into tofu lovers. Make the chimichurri and marinate the tofu at least 20 minutes before you’re ready to grill. You can also make it up to a week in advance and marinate the tofu for up to 12 hours. To make the chimichurri, simply add the olive oil, parsley, garlic, lemon juice, pepper flakes and salt to a blender and puree until it becomes the consistency of pesto. Slather the chimichurri onto the tofu pieces (save about 1/3 of it to top your sandwiches) and store in a covered, refrigerated container until you’re ready to grill. Preheat your grill (or grill pan) to medium-hot, then carefully place the tofu on the heat. Let them sit on the grill, undisturbed for 5 minutes on each side, or until the surface begins to brown and grill marks appear. Be careful when you flip them, as tofu tends to be slightly crumbly. Toast your pumpernickel bread, then pile on the tofu and greens. You can add more chimichurri if you’ve got it. Halve the sandwich for easy handling and you’ve got yourself some dinner. *To drain the tofu, place a folded paper towel on a plate with the block of tofu on it. Layer another paper towel over it, then top with another plate. You can also put a can on the top plate to ensure the excess liquid is all drained. That’s a gorgeous sandwich! I love chimichurri and it’s good with tofu. Tofu just about goes with everything. ttfn300 – You’ll LOVE it! I agree with you too. Tofu is a nice alternative somedays. I like to fry mine up with soy sauce and it makes for a quick meal. have you ever tried deep fried tofu? It’s really good, but it has this weird skin on the outside. Nonetheless, it’s pretty tasty. This looks FABULOUS. Must try! What a stunning sandwich. 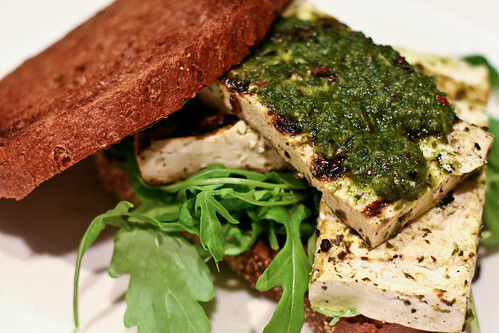 I have to admit, I’ve never had a tofu sandwich before but would love to give this a try. I’m always looking for another good tofu recipe and this one gives me a chance to try chimichurri sauce for the first time! Thanks for the recipe! I love chimichurri sauce and my husband has been vegetarian for 6+ months now. I’m always looking for different recipes. This is something I know he would enjoy and I will too. I’m going to try this over the weekend. I love chimichurri sauce with grilled chicken. I’m going to try the tofu too. Worse case, one bag of marinating chicken breast for me and one bag of tofu for him! Thanks again for a great tip.